Enjoy the road trip in your Toyota with upgraded seating or an overhead DVD player with the Genuine Toyota travel package from Tuscaloosa Toyota in Alabama ‐ serving Birmingham, Columbus, and Jasper. Long car rides drag on enough. Rigid, uncomfortable seating should be a given, there to let you sink in when the ride feels never ending. 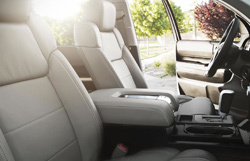 Upgrade your standard cloth seats to enhanced leather or SofTex® with the Toyota Travel Package and enjoy the comforts that only cozy seating can grant. 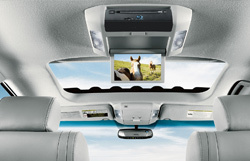 As they sink into the upgraded seating included in the Toyota Travel Package, second- and third-row passengers can remain entertained with the 10-inch Overhead DVD Player as the miles stack up. The player rests in a built-in, floor-mounted system, which depicts movies and shows on a bright LCD monitor. Along with touch control buttons, it includes a wireless game controller with 30 games and connect to the vehicle's audio system for an arena-quality effect. If the only raceway sounds you want to hear are your own, let your passengers listen into games and movies with the two included pairs of wireless headphones.